Manufacturer of a wide range of products which include golden carpet, zari carpet, jewel carpet and designer carpet. 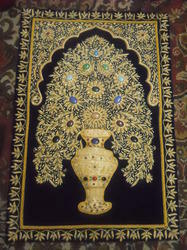 We take pleasure in introducing Golden Carpet ourselves as one of the leading manufacturers and suppliers of arabic design this embroidery panel is designed with precision employing creative techniques in fulfillment with the trends of market .our given embroidery panel is offered in different sizes designs colors and patterns to accomplish the variegated expectations of our esteemed customers Along with that we provide this embroidery panel after checking on different parameters before supplying to customers. Since last few years we are the backbone of this industry. Now have a large collection of Zari Carpet, a very stylish and premium design among our top products. This carpet is made up of very premium and high quality raw material which does not get damaged very easily. We are delivering this carpet for our valuable clients on very economical price. 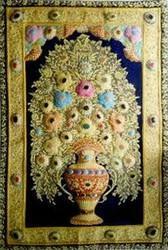 we are prominent manufacturer for these Jewel Carpet Offering pure silk embroidery handicrafts for home furnishing we produce flowered hand embroidered wall hanging with semi precious stones. 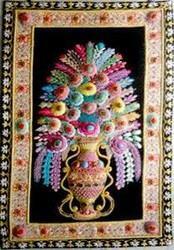 pure silk wall hanging sceneries ladies purses clutch bags, christmas hangings,hand embroidery animals, flower vases etc.we can draw any customized item as per buyer requirements drawing,sketches etc.our products exhibit the rich workmanship of our experienced craftsmen. With the help of our talented craftsmen we are able to manufacturer supply wholesale and exports our range of handicraft embroidery Designer Carpet. These finely crafted works of art are made from high quality fibers that are carefully handmade to create unique and magnificent pieces of creations.we use various combinations of colors and patterns that show the amazing authentic influence of indian art. 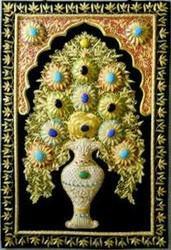 these give the elegant and stylish appeals that are have timeless appeal.Our hand embroidered wall hanging are available at very reasonable range of prices. Looking for Handicraft Carpet ?